Going to the interview, you probably will have to answer many questions about your career, experience and style of work. Many of them can be prepared in advance. The Resumance team have collected a list of questions that will help in the preparation for the interview to analyze your own experience and highlight key achievements. As a result, you will feel more free in the interview, and also be ready to answer many frequently asked questions, no matter how the recruiter has formulated them. How can I apply my strengths to a new position? What professional skills can I offer the employer? What are the key professional qualities for this position? With what difficult situation, which I successfully overcome, I had to face at work? What would I like to do in 5 years? How do I see my career development? What is the ideal job for me? Why am I leaving the last job? Why do I want to work in this position? Why would I want to work for this company? What kind of salary do I expect? What will be my first steps when I get a position? What do I know about this company? What did I like most and least of all on the last job? How do I usually work in a team? What situation do I consider critical at work? What skills help me cope with difficulties? What difficult decisions did I have to take at work? What questions do I want to ask the employer? 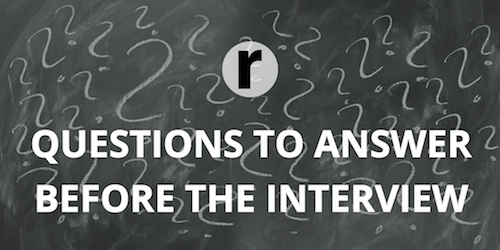 Each question in the interview is asked for a specific purpose. It's your responsibility to save the interview process from failure. Often, recruiters are trying to figure out how well you're aware of the company. However, It's not necessary to know all the details of the company's activities. The main thing to be active in the interview and show your desire to work in this position. The question of wages helps to understand how you evaluate yourself. This question should be answered with caution. Before the interview you need to determine for yourself a comfortable salary level, but it should be correlated with your experience, skills and the labor market. Many candidates don't really like the question of your plans and future. However, it can show how much the person has decided on the chosen sphere, what he wants from life in general. One of the most important questions is the desire to work in the company. This question is necessary in order to understand your reasons for choosing this company. Of course, any recruiter will like to see a sincere interest in the vacancy. In general, we advise you to be open and sincere in the interview. Such questions are important to understand whether the employee is able to cope with the work, whether he will be loyal and devoted, what role in the company will be able to take. At the same time, the candidate has every right to ask any questions to determine if he wants to work in the company. Collaborate with the recruiter and everything will turn out!